After recapturing Ramadi from the so-called "Islamic State" (IS; formerly ISIS/ISIL), the Iraqi government and allies have set their sights on Mosul, the largest IS-controlled city, and until a few years ago the second largest city in Iraq (some sources say half or more of its population fled after the IS takeover in 2014). Since our last Iraq control map report at the end of June, the main change to territorial control has been the government capture of Qaiyarah, a town south of Mosul that's still more or less surrounded by IS and Kurdish controlled ground. The following is an outline of major events since PolGeoNow's previous Iraq map update of June 30, 2016. The abbreviation "IS" refers to the organization calling itself "the Islamic State", also known as ISIS or ISIL. The Peshmerga is the military of Iraqi Kurdistan. Two weeks after the military started an advance towards the Qaiyarah airbase, they took control of a village 45 kilometers from the airfield on June 29. Subsequently, on July 9, the Iraqi army captured the Qaiyarah airbase, 60 kilometers south of Mosul. Three days later, the same forces linked up with government troops which had been advancing from Makhmour since March, after they captured a village on the Tigris riverbank north of Qaiyarah. Reports said 292 people were killed by a suicide bomber detonating an explosive-filled minibus in the Karrada district of Baghdad. IS suicide bombers attacked a Shiite shrine in a town between Samarra and Baquba, leaving 56 people dead and more than 70 wounded. The attackers fought their way through a market before reaching the gates of the Sayyid Muhammad bin Ali al-Hadi mausoleum, where they blew themselves up. Iraqi security forces captured two villages north of Ramadi from IS. The Iraqi Army launched an assault on the town of Qaiyarah. Meanwhile, Iraqi security forces captured a town in the western part of Anbar province. Iraqi security forces seized two areas south of Mosul, in the area of Qaiyarah. IS suicide bombers attacked a village 60 kilometers south of Mosul, killing 11 people, including six soldiers. Kurdish forces took control of 12 villages near Mosul. During the advances, Kurdish Peshmerga forces reached a bridge connecting Erbil, Mosul, and Kirkuk. The Kurds managed to reach the western side of the bridge, thus securing a crossing over the Grand Zab river. The crossing over the river would make it possible for Kurdish forces to eventually advance on Mosul from a new front. Meanwhile, Iraqi security forces captured four villages in the Qaiyarah area. Iraqi government forces attacked the center of Qaiyarah, fully capturing the town two days later. They claimed about 250 IS fighters were killed in the battle. Five IS attackers, including a suicide bomber, killed 15 people at a wedding in a town west of Karbala (south of Baghdad, far outside of the IS control zone). It was revealed that before retreating from the Qaiyarah airbase, IS had almost completely destroyed the facility. This was seen as possibly hindering any future attempt by Iraqi forces to retake Mosul, since the air base was intended to be used as a staging area for any future operations against the city. Human Rights Watch accused Sunni pro-government militias of recruiting children into their ranks. Graphic of the Iraqi flag is in the public domain (source). 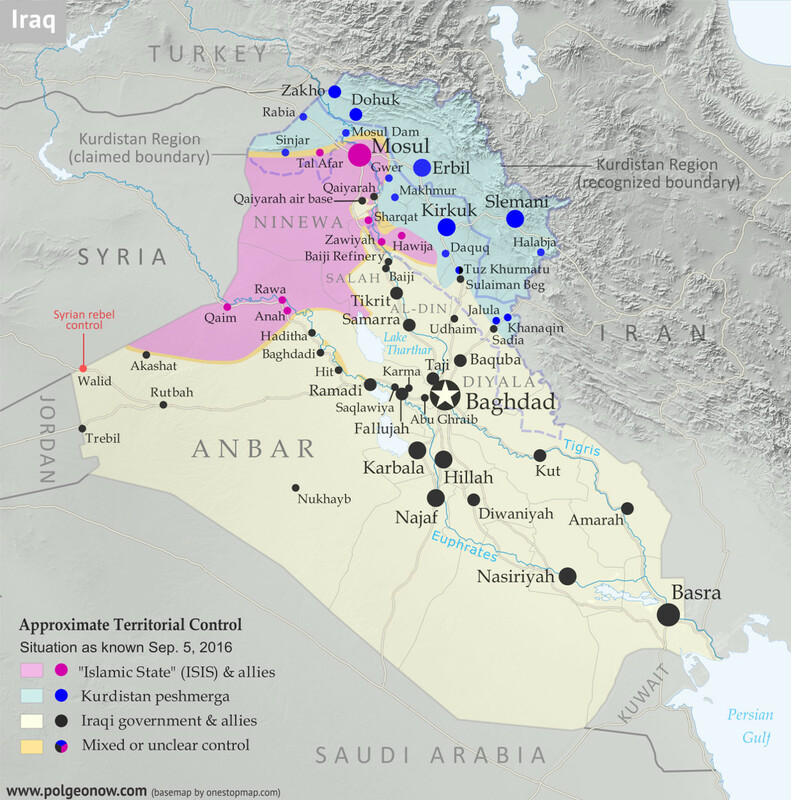 Categories: asia, conflict zones, divided countries, exclaves, free conflict maps, iraq, isis, kurdistan, middle east, original maps, rebel control, the "islamic state"